The goal of this review is to integrate - in its two parts - the considerable amount of information that has accumulated during these recent years over the morphology, biology and functions of astrocytes - first part - and to illustrate the active role of these cells in pathophysiological processes implicated in various psychiatric and neurologic disorders – second part. Increasing research interest aroused by astrocytes over the past few years led to a dramatic evolution of the concept regarding their structure and function. Ubiquitously present in all regions of the central nervous system (CNS), astrocytes are specialized glial cells, providing structural and functional support for neurons. Although considered for more than 100 years as a homogenous cell population, it is known today that glia encompasses various morphological entities that coexist; each of these populations are characterized by a particular molecular signature and specific functions related to their microenvironment. Moreover, dysfunctions of astrocytes might contribute to CNS pathological remodelling and disease . 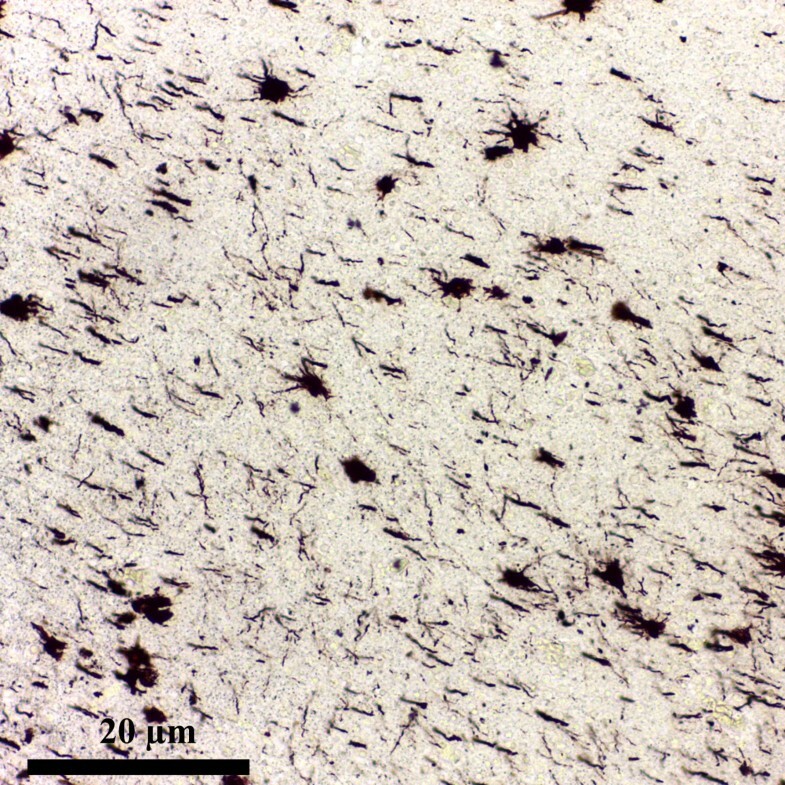 The concept of neuroglia, introduced by Rudolf Virchow in 1858, described a connective substance of the brain, represented most likely by “fibers and intercellular masses”. Otto Deiters, a German scientist, was the first who, in the second half of the 19th century, drew the astrocytes as stellate cells; later, Jacob Henle and Friedrich Merkel observed the network formed by the astrocytes processes within the grey matter . Yet it was Camillo Golgi (1872) the first who detailed and described the morphology of glial cells by using the silver-chromate technique (a black staining reaction); he observed that some glial cells (known today as protoplasmic astrocytes) displayed endfeet on their processes, attached to the blood vessels. His theory postulated that there was a link between the morphology and function of astrocytes in the CNS; regarded as the “glue” of the brain, glial cells established an interconnection between vessels and parenchyma, therefore being responsible for metabolic exchanges. In 1893 Michael von Lenhossek contrived the term “astrocyte” that illustrated the morphology of these cells. The origin of this term arouse from a combination of the latin word for stars, astra, with the word for cell, cyte, thus a star-shaped cell . 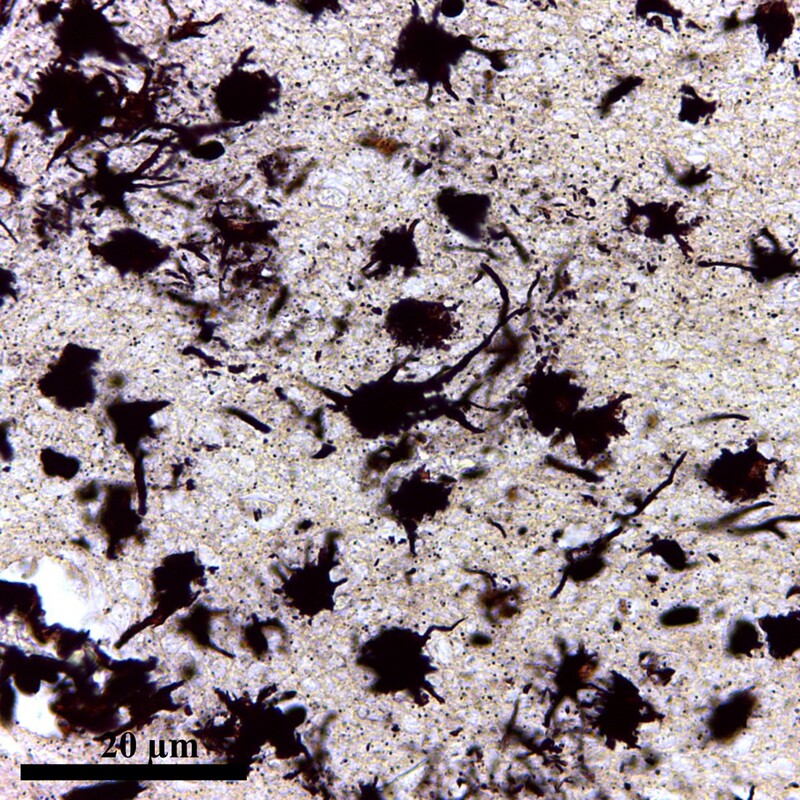 Astrocytes were further classified into protoplasmic (found in the grey matter) and fibrous (within the white matter) [2–4]. At the beginning of the 20th century the morphological heterogeneity of the CNS glia was definitely set. However, only when Santiago Ramόn y Cajal (1913) has developed the gold chloride-sublimate staining technique, the first specific stain for astrocytes, this diversity was acknowledged. Cajal is considered the promoter of the future stem properties of neuroglia since, using this method, he proved that astrocytes originate from radial glia and undergo cell division in the adult brain. Numerous functions of astrocytes (e.g. neuronal nutrition and metabolism, nervous tissue homeostasis, brain cytoarchitecture, glial scar formation) were further determined, relying on Cajal’s histological research, rendering astrocytes essential brain “homeostatic cells” either in normal or pathologic conditions . Yet, the gains regarding the functions of astrocytes were shadowed by the lack of adequate techniques that could have promoted them, versus neurons of which value was overstated by the neuronal doctrine . From the phylogenetical point of view, the organization of a centralized nervous system was marked by the appearance of astrocytes . An interesting aspect is the constant augmentation the astrocytes/neurons ratio that parallelized the evolution of the brain (about 0.16 in nematodes to 0.33 in rodents, and reaching up to 1.65 astrocytes per neuron in the human cortex) . It is considered that, in the human brain, to each neuron correspond 10 glial cells. In smaller creatures’ brain, the number of glial cells corresponding to a neuron is significantly reduced . The primordial astrocytes performed a wide range of functions in the development of the nervous system. In nematodes, the astrocytes are not only involved in neuronal development, but also enable the sensory functions . Moreover, the astrocytes’ performances improve with the evolutionary stages. For example, in arthropods glial cells fulfill an additional role, organizing the neurons in functional definite nervous centers . In crustaceans, insects and cephalopods, even in some vertebrates (sharks), the astrocytes form the blood-brain barrier (BBB) or the hemolymph-brain barrier (HBB) isolating the nervous tissue from the rest of the body . Primordial astrocytes also envelop the axons therefore being the predecessors of the myelin forming cells; the astroglial sheath of the axons improves the propagation of the action potential . In higher vertebrates, astrocytes’ role in maintaining the BBB function is completed by the endothelial cells. Besides, in this stage of evolution, astrocytes specialize for the defensive function . In humans, astrocytes achieve their greatest morphologic and functional complexity. For example, neocortex humans astrocytes compared to those of rodents, are 2.5 times larger, their processes are 10 times more numerous and they display particular histological features; the action potential velocity is also 4 times higher . Initially astrocytes were identified due to their star-shaped morphology and presence of the glial fibrils. Nowadays these features are almost outdated. The diversity of astrocytes is justified by two main factors: the heterogeneity of glial precursors and the various pathways of specific differentiation, both being influenced by the extracellular environment. Recent in vitro studies reported that growth factors levels activate in astrocytes the gene expression and regulate the transcription factors so that the subsets of progenitors are spontaneously engaged in different pathways of development . During their differentiation, between the glial precursors and the microenvironment there is a mutual influence: cells secrete various soluble factors, and, on the other hand, the extracellular matrix (ECM) molecules (e.g. lectican and tenascins family) have the ability to stimulate or to inhibit cells proliferation, maturation and migration [9, 10]. Thus, in his study, Haas C. et al. in 2012, observed that by treating GRP in vitro with specific culture media, different astrocytic phenotypes were obtained (e.g. A2B5-/GFAP+ with a flat morphology fibroblast-like when treated with fetal bovine serum and A2B5+/GFAP+ star-shaped astrocytes when treated with both basic fibroblast growth factor (bFGF) and ciliary neurotrophic factor (CNTF) . For example, if we consider a multipotent stem cell as a source of astrocytes, but initially, this cell has produced neuronal precursors, the turn towards glial differentiation implies a multi-step process. At first, a specific receptor on the surface of the multipotent stem cell modifies its structure to gain affinity for growth factors such as: fibroblast growth factor (FGF) and epidermal growth factor (EGF); then, the resulting glial precursor is subjected to the action of signalling molecules (e.g. CNTF, bone morphogenetic proteins (BMF) and EGF) that will control and continue its maturation [9, 10]. However, further research is needed in order to identify the heterogeneous subpopulations of astrocytes progenitors and accurately characterise them by new antigenic markers, physiological properties or molecular profiles . At present, three distinct pools of glial progenitors have been described in the germinal niches of the cerebral cortex: a) radial cells of the ventricular zone b) postnatal glial progenitor cells of the subventricular zone and c) glial-restricted precursors (GRP) - also found in the embryonic spinal cord (see Table 1) [3, 8]. The grey matter protoplasmic astrocytes are mostly generated by embryonic radial glia but also from the intermediate progenitors arisen from neonatal subventricular zones. Due to their different origin, the two populations of astrocytes will display different patterns of gene expression, which will enable potential different functions. The white matter fibrous astrocytes originate, instead, mainly from neonatal subventricular zone progenitors . An unexpected finding in the astrocyte research is the identification in the adult neurogenic zones - subventricular zone (SVZ) and subgranular zone (SGZ) - of a subtype of astrocytes considered to be the local stem cells. Regarded as mature astrocytes due to the expression of GFAP and glycogen granules, these cells unusually display features of both radial glia and neural progenitors (e.g. synaptic mediators’ release) . It was demonstrated that the specific pro-neural genes (e.g. 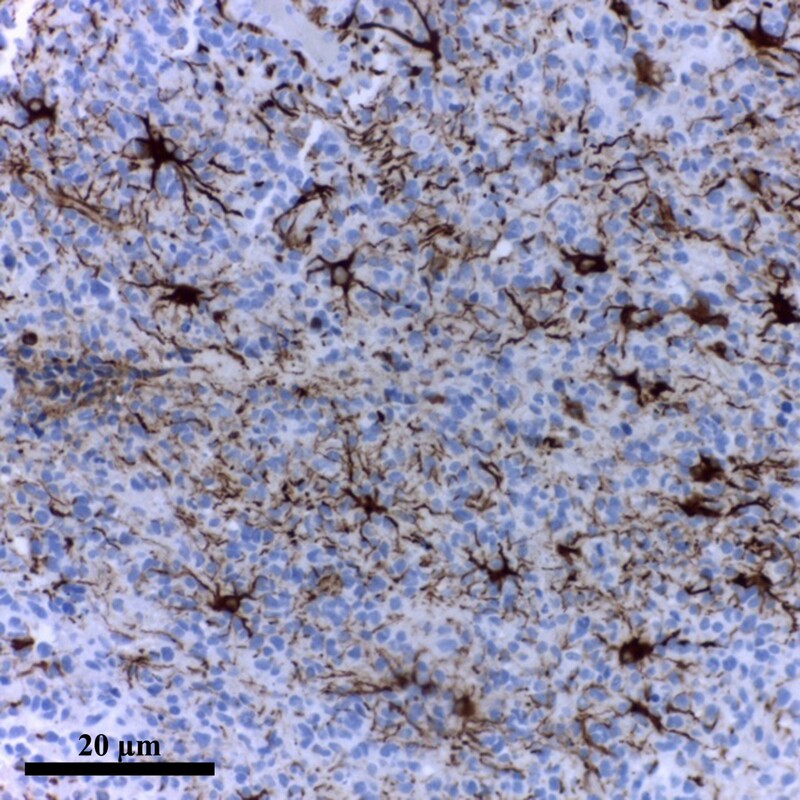 neurogenin-2 and Mash1) enable these astrocytes to regain their stem cells properties being able to differentiate into neurons . Additionally, the embryonic extracellular matrix molecules present in the neurogenic niche are capable to maintain these cells’ “stemness” [1, 17]. In the adult SVZ and SGZ, two distinct population of neural progenitors (multipotent neural stem cells) express GFAP [1, 18–20]. The SVZ progenitors and give rise to neuroblasts which migrate to the olfactory bulb (to become olfactory interneurons) [1, 19–22]. GFAP-expressing cells found in the SVZ are also been referred to as astrocytes-like cells or B cells. From the histological point of view, these cells are irregular in shape, filling in the spaces between neighbouring cells; their cytoplasm is pale with few organelles (e.g. free ribosomes) but numerous intermediate filaments; the nuclei are also irregular due to the invaginations on their surface. There are significant differences between the two types of SVZ astrocytes. Type 1 (i.e. B1 cells) are larger, with euchromatic nuclei and are located in the proximity of the ependymal cells. Type 2 (i.e. B2 cells) are smaller, with hyperchromatic nuclei and are mostly adjacent to the striatal parenchyma. The SGZ neural progenitors generate newborn granular neurons . Another type of stem cell which expresses GFAP can be found in the adult SVZ but it is not certain that these adult stem cells are, in fact, astrocytes. They have different molecular features, because they express nestin (an intermediate filament), that characterise only embryonic astrocytes, reactive astrocytes or neuroblasts and intermediate progenitors . Considering the high plasticity of astrocytes, the GFAP expressing cells in the neurogenic niche can simultaneously behave as both astrocytic and neural stem cells . Important advances in technologies to study the nervous tissue enabled the knowledge of astrocytes characteristics (see Table 2), Figures 1, 2 and 3. (All images presented in here, are microphotographs of human brain samples prelevated by autopsy in compliance with the Protocol elaborated by the Ethics Committee of “Iuliu Hatieganu” University of Medicine and Pharmacy Cluj-Napoca). • The vascular endfeet are easy to identify. • The perivascular hallo is considered to be an artefact . GFAP represents an integrator of the cellular space, but it is also implicated in complex cellular events, such as cytoskeleton reorganisation, myelination, cellular adhesion and several signalling pathways [23, 24]. • Fibrillary astrocytes contain a massive amount of GFAP in their cell bodies and processes unlike protoplasmic astrocyte. S100B (belongs to the S100 family of EF-band calcium binding proteins [1, 31]). • AldhL1 (aldehyde dehydrogenase 1 family, member L1) [1, 39]. Astrocytes overview. Metalic impregnation Ramon Y Cajal Ob. 20x. Human brain (personal collection). Astrocytes overview. Metalic impregnation Ramon Y Cajal Ob. 40x. Human brain (personal collection). Astrocytes overview. GFAP Clone GF2 DAKO. Human brain. Ob. 20x. (personal collection). For example, the grey matter protoplasmic astrocytes, are generated from embryonic radial glia and, to a lesser extent, from intermediate progenitors migrating from the neonatal subventricular zones. These two pathways of development will generate astrocytes with different patterns of gene expression and possibly different functions. On the other hand, the white matter fibrous astrocytes are predominantly generated from neonatal subventricular zone progenitors . Yet, it is important to recognize that subsets of progenitors will spontaneously differentiate in culture, as the intrinsic program of the cells modulates the process of cell division and differentiation together with culture conditions. 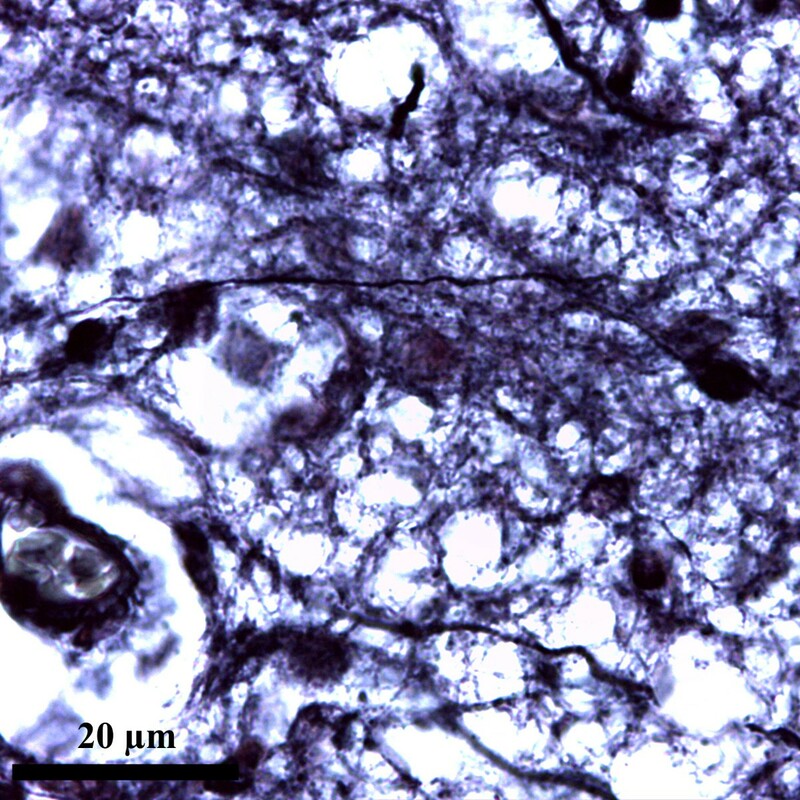 Nevertheless, treatment of GRP cultures with fetal bovine serum (FBS) resulted in the production of A2B5-/GFAP + astrocytes with a fibroblastlike flat morphology, whereas exposure to basic fibroblast growth factor (bFGF) together with ciliary neurotrophic factor (CNTF) produced mostly process-bearing A2B5+/GFAP + astrocytes. Further research is needed to elucidate the identity of the different classes of intermediate progenitors or to obtain a clear antigenic signature of the lineage . The development of astrocytes from a multipotent stem cell that prior to this has produced neuronal precursor cells, implies a specific differentiation via a multi-step process. The switch toward the glial differentiation is regulated by a change in receptor composition on the cell surface and responsiveness to fibroblast growth factor (FGF) and epidermal growth factor (EGF); futhermore, signaling molecules like CNTF, bone morphogenetic proteins (BMF), and EGF will continue to drive the glial precursor cell into the astroglial direction. However, the early astrocytes will interact with their microenvironment not only by releasing and responding to diverse soluble factors, but also expressing a wide range of extracellular matrix (ECM) molecules, as proteoglycans (lectican family) and tenascins. Lately it is considered that these ECM molecules have the ability to participate in glial development (e.g. the matrix protein Tenascin C (Tnc), proved to be an important regulator of astrocyte precursor cell proliferation, maturation and migration during spinal cord development) and those expressed by reactive astrocytes under pathophysiological conditions, are known to act mostly in an inhibitory fashion [9, 10]. The most recent and exciting finding in the astrocyte field, which challenges the traditional definition of astrocyte itself, is the discovery that there is a subclass of mature astrocytes which represent the stem cells in the adult neurogenic zones. The GFAP-expressing stem cells have characteristics of embryonic radial glia and mature astrocytes, but display subtle differences and retain properties of neural progenitors. These stem cells act in concert with resident astrocytes to contribute to cell genesis and maintaining the neurogenic environment, the niche. Perhaps these cells are retained in a transitional stage between radial glia and astrocytes, due to the persistence of embryonic extracellular matrix molecules. This permissive environment in the neurogenic niche allows the retention of intrinsic genetic programs to maintain “stemness” [1, 17]. It was shown that, the proneural genes neurogenin-2 and Mash1 possess the ability to reprogram these astrocytes to stem cells that can generate neurons . In the adult subventricular zone (SVZ) and subgranular zone (SGZ), two distinct population of neural progenitors (multipotent neural stem cells) express GFAP [1, 18–20] and give rise to neuroblasts that either migrate to the olfactory bulb (to become olfactory interneurons) [1, 19, 21, 22] or generate newborn granule neurons. GFAP-expressing cells of the SVZ have been termed SVZ astrocytes, astrocyte-like cells or B cells. The histology of these cells comprises irregular contours that filled the spaces between neighbouring cells, irregular nuclei with invaginations, and light cytoplasm with few free ribosomes. They also expressed abundant intermediate filaments. Differences were found between the two types of astrocyte-like cells. Type B1 cells are larger than type B2 cells and possess euchromatic nuclei; they are adjacent to ependymal cells. Type B2 cells are smaller with hyperchromatic nuclei and are mostly located at the interface with the striatal parenchyma . Another type of stem cell which expresses GFAP can be found in the adult SVZ but it is questionable whether these adult stem cells really belong to the astrocyte family. They has different molecular features, because they express nestin (an intermediate filament), that characterise only embryonic astrocytes, reactive astrocytes or neuroblastes and intermediate progenitors . In conclusion, there is much need for further studies to be conducted in an attempt of finding new antigenic markers, physiological properties or molecular profiles for a better definition of these varieties of stem cells and to answer to challenging question as the ability of every astrocyte to revert to stem cells given the right environment . Many novel tools to study astrocytes were given by the technological advances over the past decades. From the early Golgi stains to immunostaining for glial fibrils, or the recent dye-filling techniques (e.g. sharp electrode, patch clamp recordings, single cell electroporation), and transgenic approaches to visualize fluorescent astrocytes, our understanding of astrocyte characteristics has dramatically evolved  (see Table 2), Figures 1, 2 and 3. The morphological features and the close relationships with both neurons and capillaries are the most constant characteristics that can be used to define the astrocytic phenotype  (see Figure 4). Protoplasmic astrocyte proximal to a blood vessel. Metallic impregnation Ramon Y Cajal. Ob. 20x. Human brain (personal collection). Two major classes of astrocytes were first described in the 19th century by using the Golgi staining, which revealed their distinct morphological pattern: the protoplasmic and fibrous astrocytes. Nowadays the classification of astrocytes into fibrous and protoplasmic is considered to be outdated ; their morphological diversity can be illustrated by specialised classes of astrocytes represented by: the cerebellar Bergmann and Fananas glia, the Müller glia of the retina, the pituicytes of the neurohypophysis and the interstitial cells of the epiphysis. Additionally, in humans and primates two novel subtypes of astrocytes have been described: interlaminar astrocytes and varicose projection astrocytes [3, 4, 46–49]. (see Table 3) Figures 5 and 6. 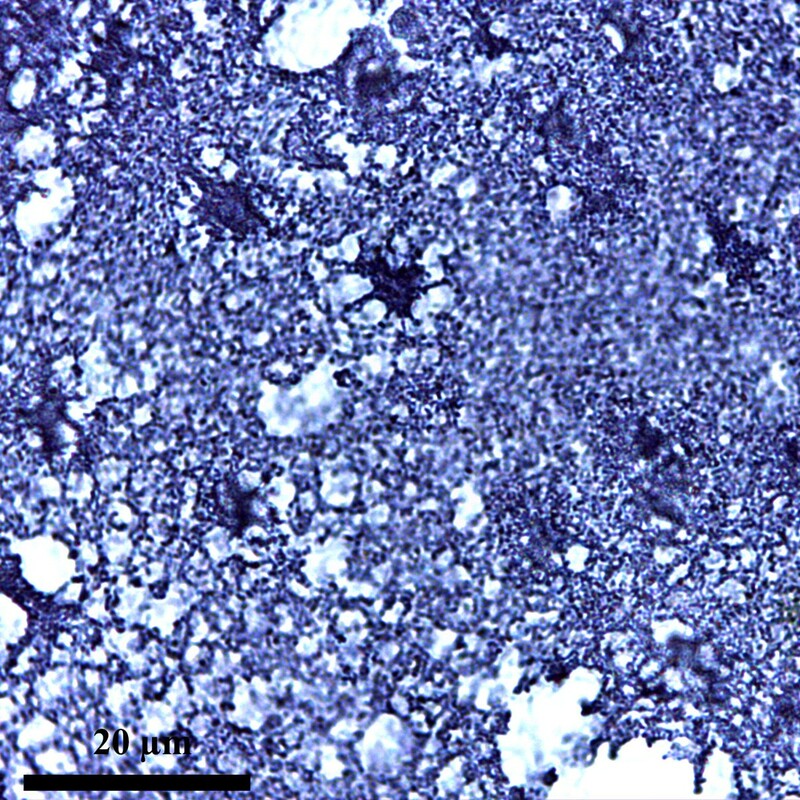 Their cytoplasm contains lipid droplets and pigment granules. Protoplasmic astrocyte. Metallic impregnation Ramon Y Cajal Ob. 100 immersion. Human brain (personal collection). Fibrous astrocyte. Metallic impregnation Ramon Y Cajal Ob. 100 immersion. Human brain (personal collection). The above presented heterogeneity of astrocytes could arise from separate lineages, plasticity of mature cells (motility and reactivity after injuries), or association of both factors [3, 54]. Methods of molecular biology, like time-lapse studies in slice culture, demonstrated the participation of astrocytes in synaptic remodelling, since the astrocytic processes are motile and enwrap active synapses [3, 55, 56]. It is well-known that mature astrocytes can exhibit forms of plasticity: motility and reactivity after injuries. Time lapse studies of astrocytes in acute slice and slice culture have shown that astrocyte processes act much like dendritic spines; they are frequently motile and contact active synapses [3, 55, 57], the role of this feature implying the synaptic remodelling. Astrocytes become reactive notably after injuries, when the intermediate filament proteins (e.g. GFAP, vimentin, nestin) are upregulated, becoming larger and there is an alteration of the domain organization [58, 59]. The reactive morphological variants comprise two main categories: the individualised and the global reactive astrocytes. Individualized reactive astrocytes encompass several types: pilocytic astrocyte, gemistocytic astrocyte, type I and II Alzheimer astrocytes. The global reactive astrocytes are the characteristic feature of reactive astrogliosis (see Table 4) . • Polymorphic nuclei, frequently eccentrical. Reactive astrogliosis, a hallmark of all forms of CNS injuries, is the result of a multi-step process involving gradates changes in astrocytes. Histopathological examinations of human brain in various neurological conditions have provided different degrees of reactive astrogliosis. According to Sofroniew et al., the following categories of reactive astrogliosis can be identified: mild to moderate astrogliosis, severe astrogliosis and the glial scar . Mild to moderate astrogliosis is a manifestation of various disorders (systemic viral and bacterial infections, non-penetrating trauma) and also found in the distant areas surrounding the focal cerebral lesions . The changes associated with mild to moderate astrogliosis are reversible if the triggering mechanism has resolved. In this type of injuries, subtle alterations occur in the expression of molecules implicated in the cellular activity: cell structure, energy metabolism, intracellular signaling, membrane transporters and pumps . Various functional categories of genes and molecules modulated by reactive astrocytes can be either upregulated or downregulated, depending on the trigger or the moment after the insult. As a result of these alterations, specific histopathological features can be identified in astrocytes (see Table 5). • Transcriptional regulators: STAT3, NFκB, Rheb-m TOR, cAMP, Olig2, SOX9 [61–65]. Severe diffuse reactive astrogliosis is characterised by permanent, pronounced and long-lasting changes and it is found in the areas surrounding severe focal lesions or infections, as well as in neurodegeneration . Compact scar formation occurs in most severe injuries, such as overt tissue damage (e.g. penetrating or contusive trauma), inflammation initiated by invasive infections or abscesses, neoplasm and chronic neurodegeneration. Reactive astrogliosis reaches its highest level of activation: astrocytes undergo intense proliferation, and their long, branched processes overlap (see Table 5) . Any cell type in the CNS (e.g. neurons, all types of glial cells, endothelial cells and leucocytes) is potentially able to release the molecular mediators of astrogliosis . Signaling pathways and molecules implicated in mediating specific aspects of reactive astrogliosis include: STAT3 (signal transducer and activator of transcription 3), NFκB (nuclear factor kappa B), cAMP (cyclic adenosine monophosphate), all these inducing upregulation of structural molecules (e.g. GFAP, vimentin, nestin) [62, 63, 80]; moreover, STAT3 induces astrocyte hypertrophy, scar formation and exerts anti-inflammatory effect ; NFκB exerts pro-inflammatory effect [63, 81]; Olig2, Endothelin-1 induce astrocyte proliferation [65, 82]. The newly formed cells in the glial scar derive from different sources: mature astrocytes that re-enter the cell cycle, NG2 progenitors and ependymal cells progenitors. Molecular mediators and triggers leading to proliferation include: cytokines and growth factors (e.g. IL (interleukin) 6, LIF (leukemia inhibitory factor), CNTF, IL1, IL10, TGFβ (transforming growth factor), TNFα (tumor necrosis factor), INFγ (interferon), [63, 69]), Toll-like receptor ligants , LPS (lipopolysaccharide), molecules of oxidative stress (e.g. NO (nitric oxide) and ROS (reactive oxygen species) ), modulators and neurotransmitters (e.g. noradrenalin and glutamate ), ischemia associated hypoxia and glucose deprivation , neurodegeneration associated amyloid- beta  and ATP (adenosine triphosphate) released by cell injury . Reactive astrocytes interact with other cell types: fibromeningeal cells and NG-2 positive glia and are associated with a dense collagenous extracellular matrix to form complex glial scars [60, 62, 87]. The changes leading to scar formation persist even after the triggering factor has been removed [61, 62, 88, 89]. 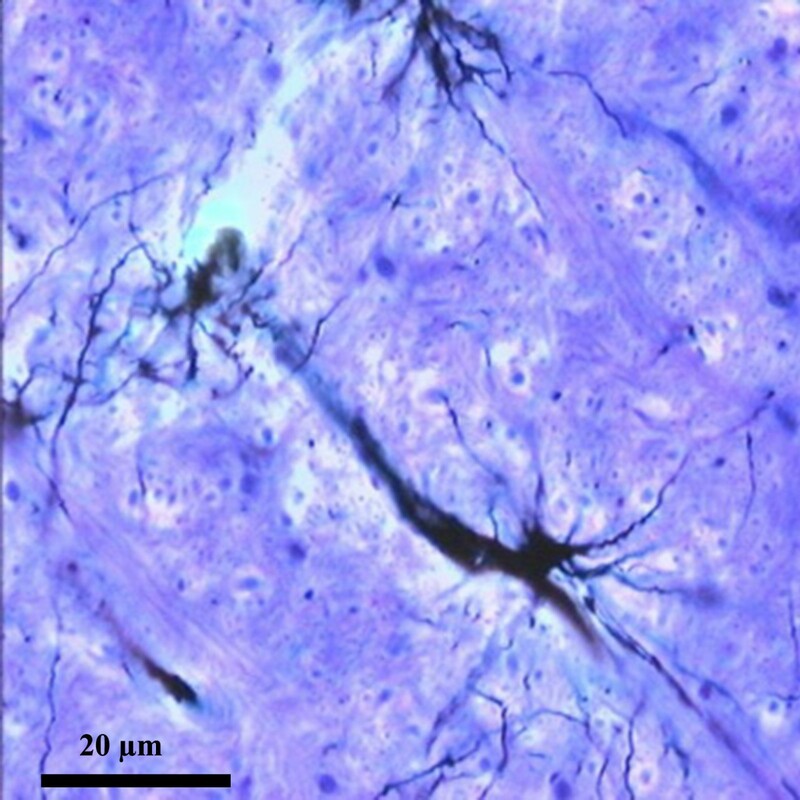 Recent evidence suggest that the glial scars might have a beneficial role, as they form narrow, dense and compact barriers; these barriers delimit the periphery of severe tissue damage, isolate the lesion, thus preventing inflammatory cells and infectious agents from spreading into the healthy parenchyma . This part of the review is an insight into the morphology and biology of astrocytes, with an emphasis on the latest findings concerning the novel cell subtypes, the developmental lineages and their functions. From the very first description of astrocytes in the 19th century, these cells concept has been at a standstill until recently when it remarkably progressed. The variety of glial precursors, their ability to display stem cells features and different adult astrocytes morphology certify that the astrocytic phenotype is influenced by both the local cytoarchitecture and the functional requirements in specific brain areas. The images are part of the personal collection of the first author. Both authors contribute to the synthesis of the data from the actual scientific literature. All authors read and approved the final manuscript.